Americans of Hispanic descent have much to offer mainstream environmental initiatives. December 9, 2015 — Kimberly Wasserman was born and raised in Little Village, a Chicago neighborhood with an 83 percent Latino population and two coal-fired power plants — one less than a mile from her home. When she had to rush her 3-month-old baby to the hospital with an asthma attack in 1998, Wasserman decided enough was enough. She successfully campaigned for the closure of the two plants in 2013 — then went on to transform industrial areas around Chicago into open and green spaces such as parks, sports fields and picnic areas and eventually win the Goldman Prize for her efforts. 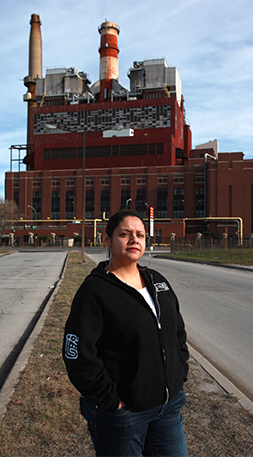 After rushing her son to the hospital with an asthma attack, Kimberly Wasserman successfully worked for the closure of two coal-fired power plants near her largely Latino neighborhood. Photo courtesy of Goldman Environmental Prize. Wasserman’s position as a Latina interested in improving the environment is not unique. In a nationwide survey of Latino voters last summer by the opinion research firm Latino Decisions, 85 percent of respondents agreed that addressing smog and air pollution should be a priority for the president and Congress. Three-quarters supported establishment of national standards to prevent climate change. Nearly 80 percent supported development of clean energy, and 90 percent were in favor of enforcing and strengthening the Clean Water Act. Despite this, efforts by politicians and groups concerned about the environment to engage Latino communities seems to be lagging: The Latino Decisions poll also revealed that more than three-quarters of respondents have never been contacted or encouraged by an environmental organization to take action on behalf of the environment. With nearly 40 million Latinos eligible to vote in the next U.S. presidential election, the numbers of potentially engaged individuals — and possible political clout — are enormous. How might environmental groups better connect with Latinos? “The best way for mainstream organizations to engage Latinos is to partner with local Latino-based organizations, identify issues that resonate locally, and work together to find solutions,” says Mark Magaña, founder of the nonprofit GreenLatinos, one of the organizations that commissioned the Latino Decisions survey. “Latinos do not simply mobilize for a movement or a cause. They do [it] to improve their livelihoods and the future of their children.” – Mark MagañaAccording to Magaña, the specific issues groups focus on for collaboration are important. “Latinos do not simply mobilize for a movement or a cause,” he says, “They do [it] to improve their livelihoods and the future of their children.” Other reasons Latinos and other minority groups engage with environmental activities include economics, religious beliefs, and interest in improving food access and security. The desire to improve livelihoods, for example, is what motivates groups such as Tamales y Bicicletas, a Minneapolis-based organization that uses bicycles to inspire cultural empowerment among Latino youth and advocate for environmental and food justice in their communities. Similarly, UPROSE, Brooklyn’s oldest Latino community–based organization, works to increase local knowledge of environmental and public health issues by connecting youth with projects to test for contaminants in local waterways and air pollutants in their community. 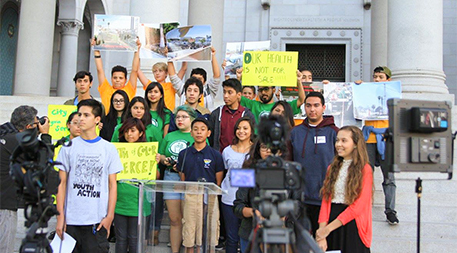 Latino students gathered at Los Angeles City Hall last month to speak about their experiences living next to oil-drilling sites. Photo courtesy of Redeemer Community Partnership. Working for a brighter future for children in many cases means concern for clean air. According to the Centers for Disease Control and Prevention, 22 percent of poor Latinos have asthma, compared with 12 percent of poor whites. And Latinos are 60 percent more likely to visit the hospital for asthma-related complications than are non-Latinos, according to the U.S. Department of Health and Human Services Office of Minority Health. It also means addressing the threat climate change poses for generations to come. This past October, more than 5,000 community members, advocates, leaders and policy-makers from organizations representing Latino constituencies met in Denver, Colorado, as part of the Americas Latino EcoFestival, an annual multicultural environmental event. Among other things, the festival launched a climate-training program and called for actions on climate stewardship and a transition to renewable energy sources by boosting Latino and youth engagement. Some mainstream environmental organizations have begun to build relationships with Latino environmental advocates and groups. The Natural Resources Defense Council, for example, has expanded its environmental justice work by partnering with local Latino community–based organizations to achieve mutual goals such as improving air quality and protecting children from pesticides. The Sierra Club, for its part, is engaging Latino communities in its Borderlands campaign to protect the environment and public safety at the United States–Mexico border. Thomas Macias, a professor of sociology at the University of Vermont who has studied environmental perceptions among racial and ethnic groups in the U.S., says such efforts by environmental groups to engage Latinos are a good start. To further increase engagement, he suggests mainstream organizations seek to learn from and collaborate with existing initiatives within Latino communities. “Reaching out to preexisting organizations and not coming into the community as an outsider is important,” he says. In recent election cycles, Latinos have been viewed as a key voting bloc. Most of that attention to date has focused on Latinos’ views on immigration. As the Latino Decisions poll and growing evidence of environmental interest and activism among Latinos show, the future of the mainstream environmental movement could be dramatically affected by the extent to which it recognizes Latino interest, enhances Latino voter participation, and works alongside Latino communities to address issues of mutual concern. Editor’s note: Idalmis Vaquero produced this article as a participant in the Ensia Mentor Program. 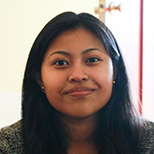 Her mentor for the project was science journalist Aleszu Bajak, founder of LatinAmericanScience.org.